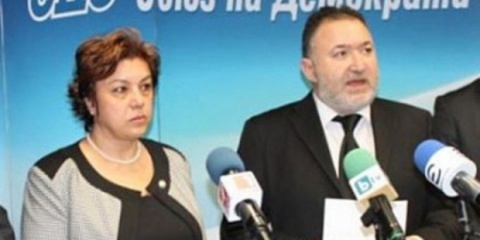 The Parliamentary Legal Committee has received a money laundering tipoff against Galya Gugusheva, Deputy Dead of Bulgaria's Special Anti-mafia Prosecutor's Office of Appeals and candidate for constitutional judge of Bulgaria's right-wing Union of Democratic Forces party, UDF. The letter, alleging that Gugusheva has been involved in money laundering through businesses linked to her relatives, is signed by Petar Vanev, an attorney in the second largest city of Plovdiv, and lecturer at the Sofia University and the University of National and World Economy. It comes just ahead of the candidate's hearing before the Legal Committee, scheduled for December 12, prompting fears that the "Veneta Markovska" scenario might have a repeat, moreover because the tipoff against Markovska was deemed anonymous while now it is signed by a known lawyer. Unlike the first time, when she refused to examine the allegations against Markovska, the Legal Committee Chair, Iskra Fidosova, was quick to inform that letters have been already sent to the Supreme Judicial Council, VSS, and its Inspectorate, asking them to probe the tipoff. Fidosova is firm the Legal Committee would not count only on Gugusheva's own explanations. The tipoff claims that there is reasonable doubt about the candidate's links to individuals and financial structures owning assets and resources with unclear or suspicious origin, including the use of "dummies" in their activities. It further notes that the magistrate has significant revenues in contradiction with her post in the judiciary. According to Vanev, one of the Prosecutor's sons, attorney Stefan Gugushev, has assets in the amount of BGN tens of millions in 8 companies, which he acquired at the age of 27, quickly after graduating from college, without any work experience and own finances. All of Gugushev's companies have been registered in 2006 and 2007, shortly after the mother was appointed at the Sofia Regional Prosecutor's Office and moved from the small town of Kazanlak to the capital. The letter further focuses on the "Legal Partners" company, about which a week ago Gugusheva explained it was a family investment firm, owned by her mother, Totka Ahchiyska. The magistrate had also been one of its owners with a BGN 5 000 capital. Later the company's stakes were sold to a business registered in Albany US, owned by two other firms registered in the Seychelles. Stefan Gugushev is the assigned attorney of the above business, authorized by a notary in Cyprus with two individuals from Cyprus listed as the real owners. According to attorney Vanev, Gugushev increased the capital of "Legal Partners" from BGN 5 000 to BGN 1.9 M. Immediately after that, "Legal Partners" acquired a number of properties in downtown Sofia, the suburb of Bankiya, and in the winter resort of Razlog. Then, in July 2011, Ahchiyska became again the owner of the company, which at that time had already BGN millions as capital. Vanev insists the origin of these millions is unknown and shady, stressing the son personally wired them in the company's accounts in 2009 and 2010. In addition, one of Gugusheva's apartments, listed in her property declaration, is also the registered address of another company, "Victorian Properties," also owned by her mother. The properties of the Prosecutor made the news after her nomination, and it emerged that she received at the beginning of the year EUR 95 000 in the form of donation from her son, while in 2008 her and her husband received as donation an apartment in Sofia, which is also the registered address of "Legal Partners." In 2009, Gugusheva received from "Legal Partners" a loan in the amount of BGN 105 000. Until December 2007, "Victorian Properties" owned 40% stake at "Katarino Partnerships," an investor in the hotel complex "Katarino," in the winter resort of Bansko. It was completed in 2005 with initial financing from EIBank where Tsvetelina Borislavova, the former live-in girlfriend of Prime Minister, Boyko Borisov, had a large stake and was the President of its Control Board. One of Stefan Gugushev's companies in Plovdiv is registered at the same address as the Global Bulgaria Association, with one of its founders, Svetoslav Bozhilov, also owning shares in the Bansko complex. The letter further informs that in 2012 Gugusheva received in the form of donation from her mother seven real estate properties in the Stara Zagora region. Vanev insists on a probe in all of the above. The Chairman of the VSS Ethics Committee, Yasen Todorov, stated the information received from the Parliamentary Legal Committee will be examined at the Monday VSS meeting. The probe, however, would not conclude by the parliamentary vote on the nomination, scheduled for December 19. Todorov says nevertheless it is a must. Vanev and Gugusheva have not yet been reached for comments.